Aperture Jam: Poster - "Kiwi Kong VS. 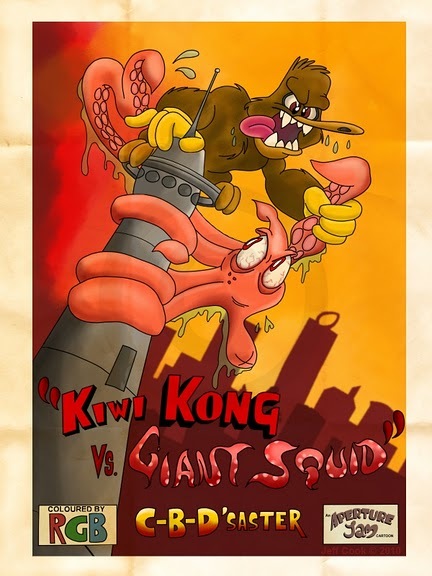 Giant Squid"
Poster - "Kiwi Kong VS. Giant Squid"
This is a poster I've been meaning to put together for about a year now. Finally done. Last year I drew and cleaned up a personal poster design but that was as far as I got with it. Now almost a year later I've pulled it out and have coloured it up. The idea was to make a faux movie poster for a B grade Monster movie, and this was the result. Two creatures duking it out above the streets of Auckland. It's something I would like to make into a short cartoon one day... or maybe a cartoon within a cartoon. Deep! Hand drawn, Pencil on Paper. Inked, Coloured and Composited with open source software including 'Pencil' and 'Gimp'. The folded paper background was "Tea Soaked" and scanned. I have to get a copy printed for my room, can anyone recommend the best printers in Auckland to get this done? I'm thinking of getting it printed at A1 size. Also if anyone thinks they might be interested in one of these, then be sure to let me know. I selfishly made this for myself and don't know if it appeals to anyone else.